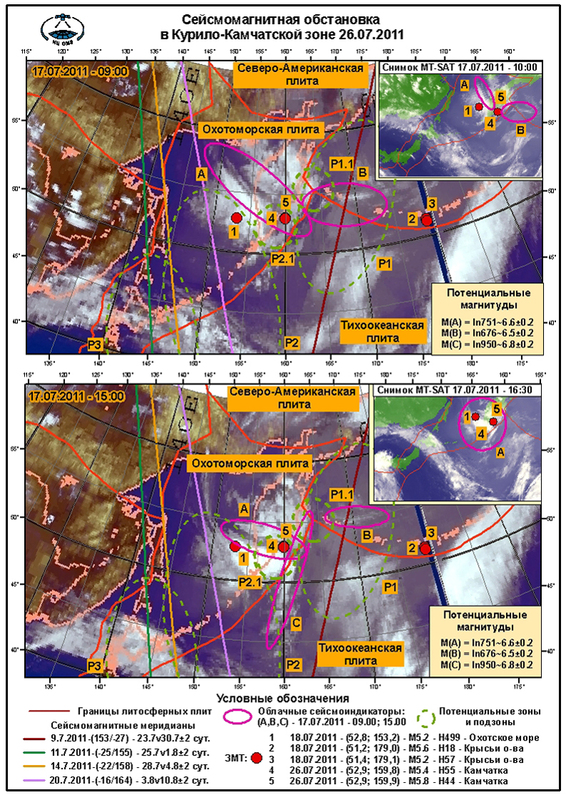 On July 26 at the offcoast zone of Kamchatka powerful Earthquake with M5.8 occured, thereby corroborating our concerns about possibility of such seismic event (Appendix 1). At the Petropavlovsk-Kamchatskiy city, located at the distance of 83km away from the epicenter, it were felt tremors of 3pt. There were no victims and damage. Disturbing situation at Kamchatka were reported in the message of June 29, 2011, and lately in the message of July 19, 2011. There were presented possible parameters of earthquake. They were corroborated (Appendix 2). But, the magnitude was declared as of M6.8+. It must be taken into account that on July 21–22 Kizimen volcano was activated, thus compensating a part of energy. And it is not by chance that M.V. Lomonosov said: «Volcanoes – safety valves of the Earth». Situation was identical to the July of 2010. Then also 2 events with magntitudes of M4.5/6.2 occured on July 30 in nearly the same zone (message of August 3, 2010). In whole, kamchatkan earthquake occured on the background of a sharp increase of seismic activity (Appendix 4). 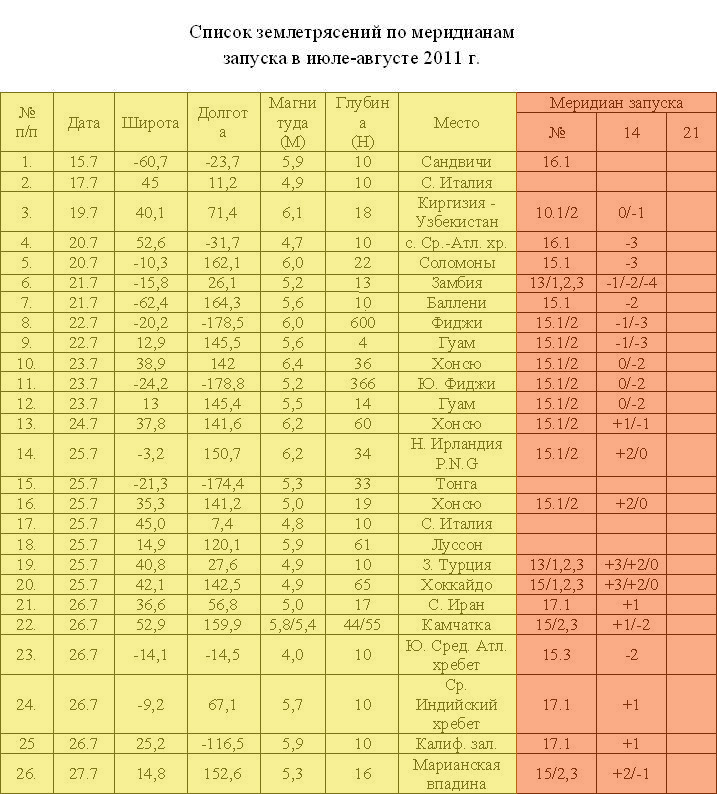 We do not exclude further development of seismic situation in Kamchatka to the worse. Serious concern also causes the situation at the Honshu (Zone P3 in Appendix 2). It is beginning the 4th phase of our experiment of checking the relationship of seismic and geomagnetic activities. 12 seismomagnetic start-up meridians are being checked. 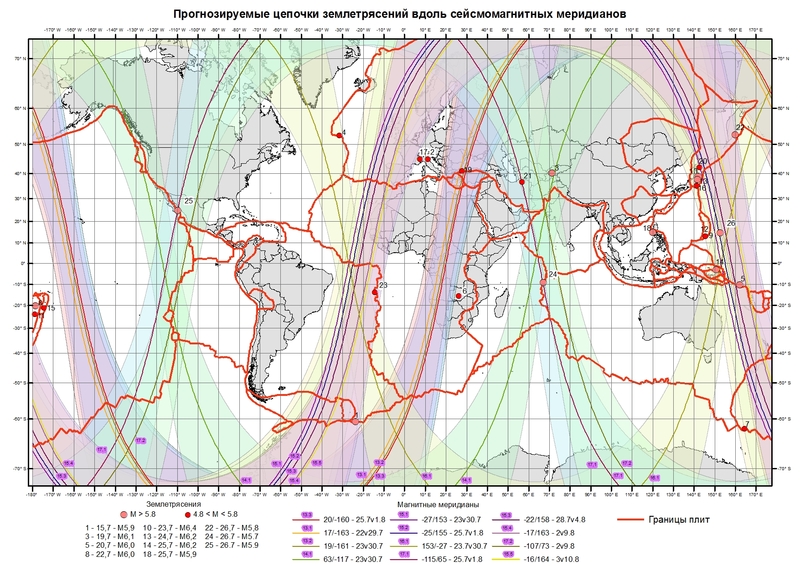 By July 15-27 26 events has been launched, 9 of them having magnitudes of 5.9-6.2 (Appendix 3,4). Noting that previous phase of experiment resulted in launch of 90 earthquakes.